Dexter Fletcher is currently hard at work on the edit of Rocketman. However, the director took some time out to respond to rumors that the biopic on musician Elton John was going to cut a 40-second love scene between the musician and his partner John Reid. It had previously been reported that Paramount wanted Fletcher to cut out the scene and that the director was under pressure to do so. However, the tip came from an anonymous source who was apparently making things up. When the censoring of Rocketman news started to spread, director Dexter Fletcher decided to respond. Fletcher was also involved in taking over for director Bryan Singer on the Bohemian Rhapsody biopic, which was criticized for taking much of Freddie Mercury's personal life out of the movie. Mercury was bisexual and many feel that the movie did not do a good job of representing that. Keeping that in mind, Fletcher decided to respond to the Rocketman rumors. He had this to say. "Seeing much speculation about Rocketman!! That's good!! It's still unfinished so it's nothing but rumors. It has and always will be the no holds barred, musical fantasy that Paramount and producers passionately support and believe in. See for yourself May 24. Dx x." News spread like wild fire that Dexter Fletcher was being forced by Paramount to cut the 40-second love scene involving Elton John and his former manager. However, no official statement from the studio was ever made in response and it seems likely that the original report was more than likely made up after the Bohemian Rhapsody controversy. Fletcher is well aware of this, which is probably why he chose to take a break from editing to respond to the rumors. 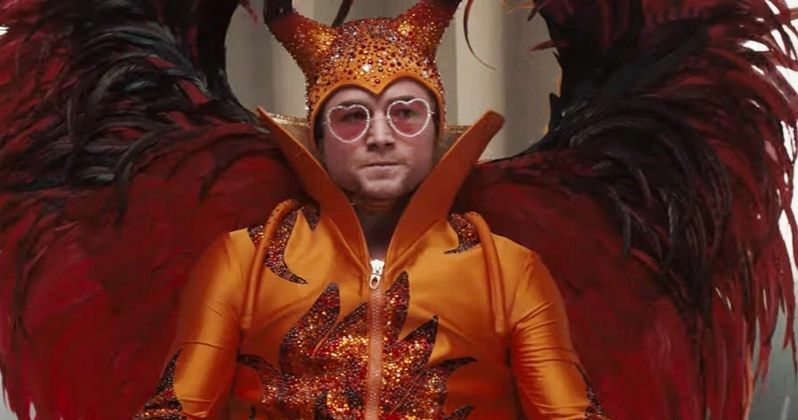 The Rocketman director is still currently in the editing phase and it doesn't sound like any executives have even seen a cut of the Elton John biopic. With that being said, John is openly gay and is a producer on the project. It's hard to believe that he wouldn't want certain parts of his personal life represented accurately on the big screen especially since he has worked so hard for the right for himself and others to do so over the years. Rocketman has always had an edge to it, even from the promotional material. The movie recently held a partial screening at the Troubadour in Los Angeles where it received rave reviews. It seems that there has been an effort to make a grittier biopic than Bohemian Rhapsody, something that is more real. Elton John's husband, David Furnish, says that John always wanted the movie to go further and tell the awful truths. The musician also reportedly told Fletcher to go as R-rated as he had to go in order to tell the best story possible. You can read the response to the editing rumors below, thanks to Dexter Fletcher's Twitter account.